Here we will only cover the important items within setup(). The first value is the SDA pin and the second specifies the SCL pin. On the Adafruit Feather Huzzah we use pins 4 and 5. 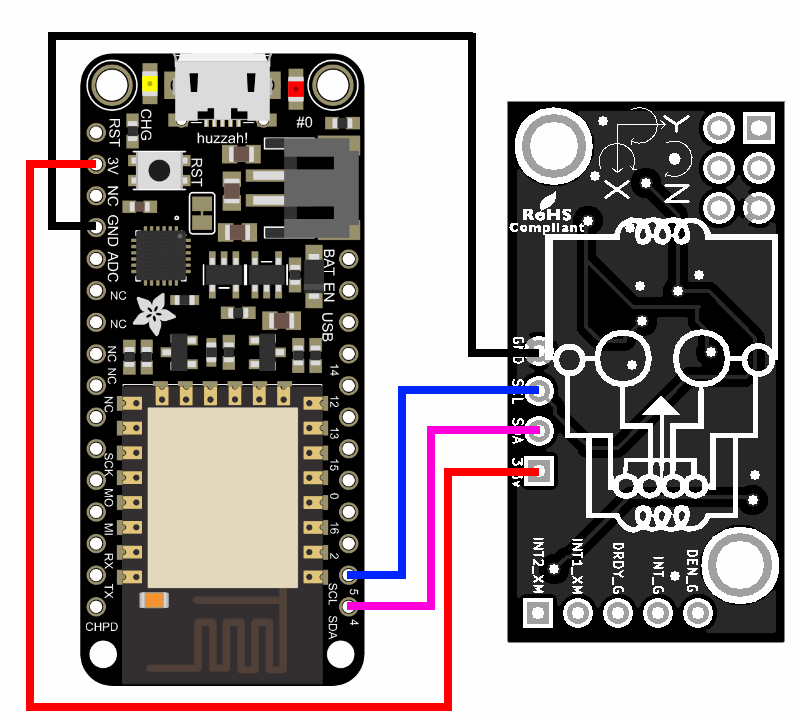 Any pin on the ESP8266 can be used for I2C. Then the web services is started. Calibration data from the BMP180 on BerryIMU is then read. Each BMP180 is different, at time of manufacture, calibration data is written to EEPROM on the BMP180. NTP time is returned as UTC. To set it to the correct timezone, modify the below line with timezone offset. During setup we need to calculate how much RAM can be used to store data. This is done in allocateRam(). RAM for TCP/IP Stack. If using the refresh function on the main page which has gauges, then there needs to be enough RAM left to accommodate the TCP sessions for the refresh. RAM for the array which stores temperature and pressure data. RAM for the ESP8266 to run. We will allocate as much RAM as we can to track historical data. This means, we need to work out how much RAM we will need for the TCP/IP stack and we also need enough for the ESP8266 to run. Once we get this value, we can allocate the rest of the RAM to the array used to store the data. number-of-refreshes-in-2-minutes x RAM per REFRESH = RAM required for TCP/IP stack. We then need to reserve some spare RAM for the ESP8266 to run. 10,000 KB should be enough. The less frequent the refresh will result in a smaller value needed to be reserved. And this also means more RAM can be used to store historical data for a longer period. Once we know how much RAM to allocated for TCP/IP and ESP8266 to run, we can use the rest of the RAM to store the data. Divide the free RAM by the size of the variables used to store the data. This will allow us to work out the maximum number of records we can store. numberOfRows = free / (sizeof(float)*2+ sizeof(unsigned long)); // 2 x float for temp and pressure. one x long for time. Now re-declare the arrays with the number of rows. The temperature and pressure is read within the main loop. First, we need to let the BMP180 know that we want to read the temperature. The function startTemperature() informs the BMP180 that we want to read the temperature by sending BMP180_COMMAND_TEMPERATURE (0x2E) to the register BMP180_REG_CONTROL (0xF4). It returns the time to wait before a value can be read. The below code reads the temperature value once the delay value in 'status' has expired. The temperature returned is in Celsius, this is also converted to Fahrenheit and stored in 'F'. We now need to inform the BMP180 that we want to read the pressure. When information the BMP180 that we want to read pressure, we also need to specify the oversampling to use. Below, we specify 3. The startPressure() function sends BMP180_COMMAND_PRESSURE3 (0xF4) to the register BMP180_REG_CONTROL (0xF4).It returns the time to wait before a value can be read. The below code reads the pressure value once the delay value in 'status' has expired. The portion of code below adds the current recorded temperature and pressure to the array. It first checks to see if the poll period is expired. It then checks to make sure each value is a number. The variable count is used to work out if the array is full or not. When the ESP8266 is first started, the array is empty and we just keep adding values to the next available row. Once the array is full, we cycle the data and then add the latest values to the end. The current time is also captured. The web server functionally we using is very basic and has no error checking. In saying that, it is all we need and it performs the job well. "/" Root or the home page. This is where the gauges are displayed. "/data.json" is only used to provide data for the gauge refresh. "/chart.html" shows the historical data within a chart. The code below will check to see if a client is connected, it then reads the requested web page path and stores it in sPath. The gauges, chart and table use Google Charts to display the data. This is a great option as it takes the load away from the ESP8266. 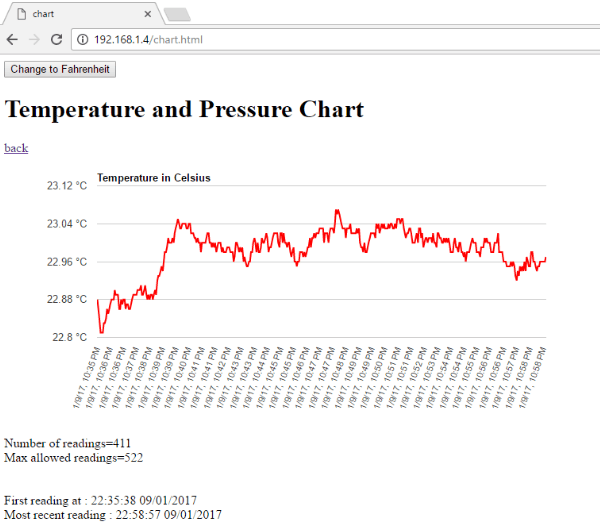 When a web browser requests a page from the ESP8266, the ESP8266 will respond with a HTML page which will have the temperature and pressure data, as well as code which will force the browser to use google charts to display this data. Creating HTML pages for the ESP8266 web server is easy, however the pages have to be built from scratch. This means you have to include html headers and GET response codes. The code snippet below is the code which creates the page for the chart. Here is an example of what the final page looks like. The first thing we do is declare a string(htmlContent) which is used to store the html content. It is important that you don't make the string to large before sending to the web browser, otherwise the ESP8266 will crash. You can see that in the code snippet below that halfway through the html page, I send the string and then starting building the string again. //Standard html header stuff here. Use the developer tools (F12) in your browser to troubleshoot. "\n" is not needed, however it makes the source for the html file more readable. Quotes used within html have to be escaped out with backslash "\". Dont make the the string htmlContent too large as it will crash the ESP. 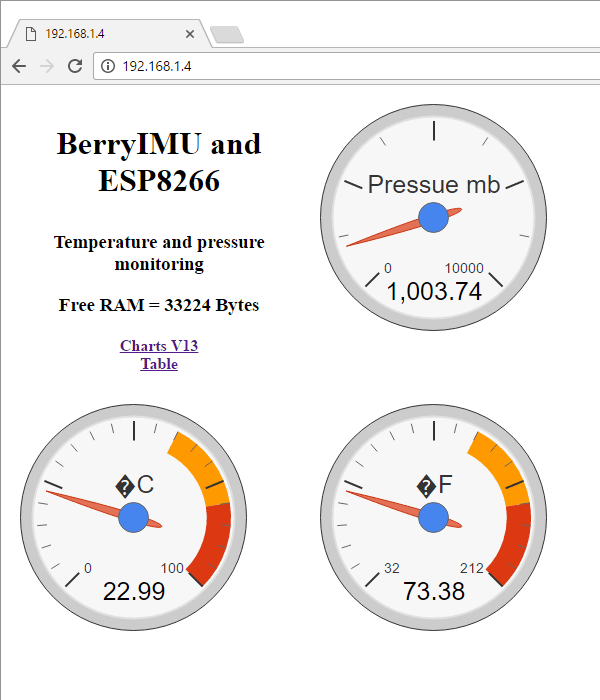 Pingback: BerryIMU + ESP8266 + Google Charts = Temperature & Pressure Dashboard « Adafruit Industries – Makers, hackers, artists, designers and engineers! hello wher is the full code?